During my regular excursion into nature, I would often encounter this large and Prehistoric looking bird with big bluish, grayish plummage. I have seen this giant Great Blue Heron many times, but have never gotten tired of Michigan Blue Heron presents, its high glide, loud squawk and proud elongated super strut. With an open in-flight wing span that can extend over six feet, the blue Michigan Bird of nature is hard to miss. Whether seen in one of Michigan’s wetlands or Metro Parks, walking on the ground, gliding close near the water’s surface or flying high, Big Blue is lord of the skies and one of the rare birds that with it’s every move ,can become the center of everyone’s attention. The loud squawk of this peculiar Michigan trademark bird is truly reminiscent of a sound coming right out of one of those infamous Jarassic Park movies. If you happen to startle one of these wetland birds the Big Blue will bealow out a deep bass-like, slow motion, long cackle sound that fills the surrounding air. Or, it will cackle at other Herons that enter it’s territory uninvited. It is a common sight to watch one Blue Heron chasing close behind another until it reach the outer edge of the more dominate Blue Herons domain. After settling territory dispute, the giant heron will slowly circle the area then glide back down looking as light as a feather where upon it can resume it’s fishing activities. 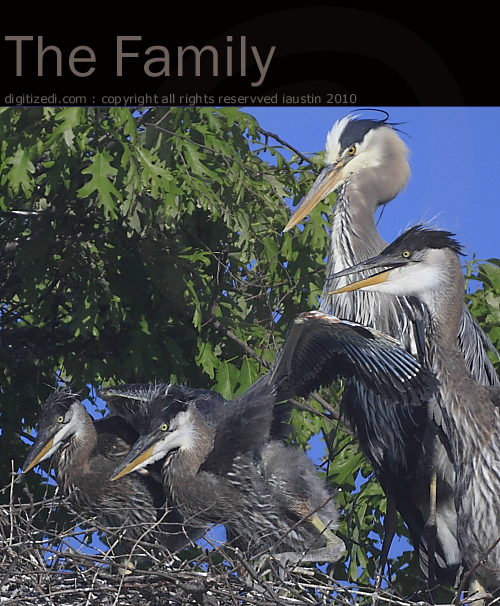 The Great Blue Heron birds of Michigan that raise their young in a community of other Blue Herons and sometimes the colony is shared with White Egrets high in the tree tops. What a spectacular sight of nature to behold which will also provide many opportunities for nature photography of this awesome Bird of Michigan. The Great Blue Heron will often make a grand entrance to the wetland by first circling high above then slowing descending with it’s wings extended outward and legs pointed downward. 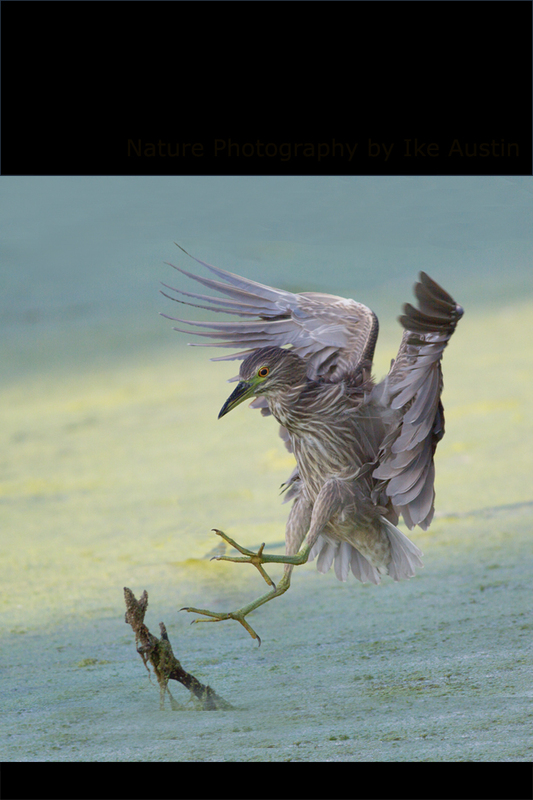 After landing, the heron will stand motionless assessing the area for possible danger. Then after the surveillance is complete, a quick wing fluff ritual is conducted to tiddy up the plumage. He then gaze down toward the water… let the hunt begin! Blue Heron ready to attack. 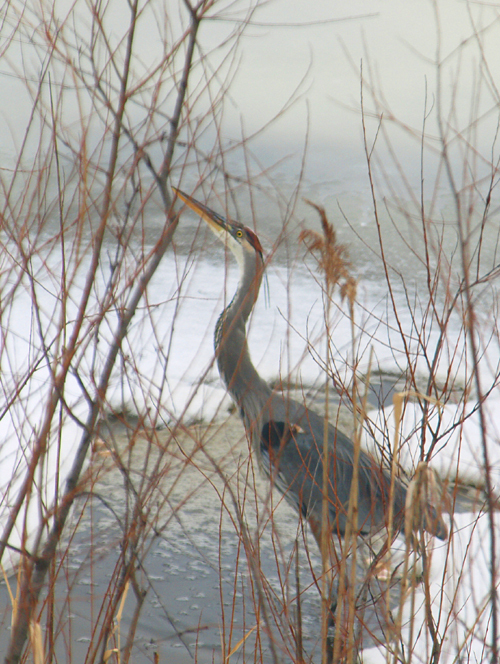 This giant Blue Heron leaped out of the water and then quickly enjoyed a two piece catfish meal! Notice the beautiful shades of bluish gray plumage of the various second and first primary feathers from this top down view of the bird in flight. 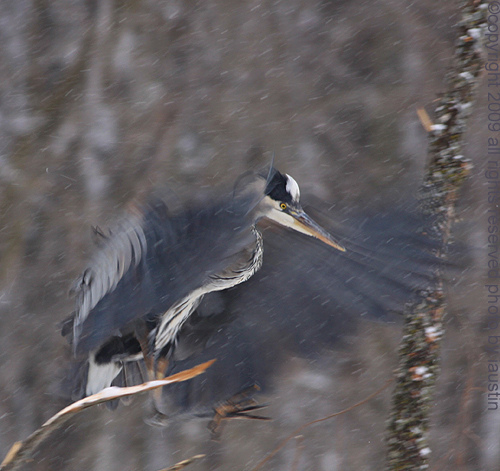 View a couple of more Great Blue Heron photos shown below, shots taken at Kensignton and Erie Metro Parks. Kensington Park located in S.E. Michigan boasts one of the largest and oldest Heron Rookery in the State. It is comprised and populated with Great White Egrets and Great Blue Herons. Nest building is very active in the early months of April. 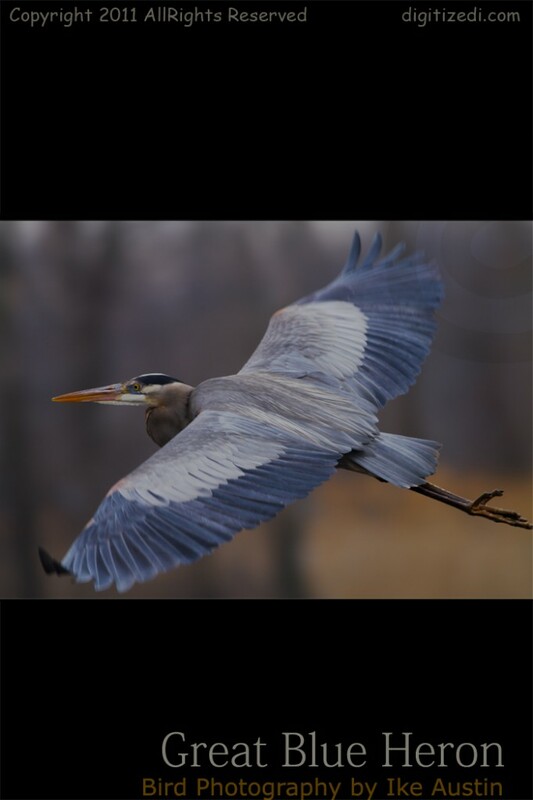 The Michigan Blue Heron is a long 4′-6′ wingspan, blueish and gray plumage, long skinny legs, and long neck. Extended wings in flight and typically flap and glide. 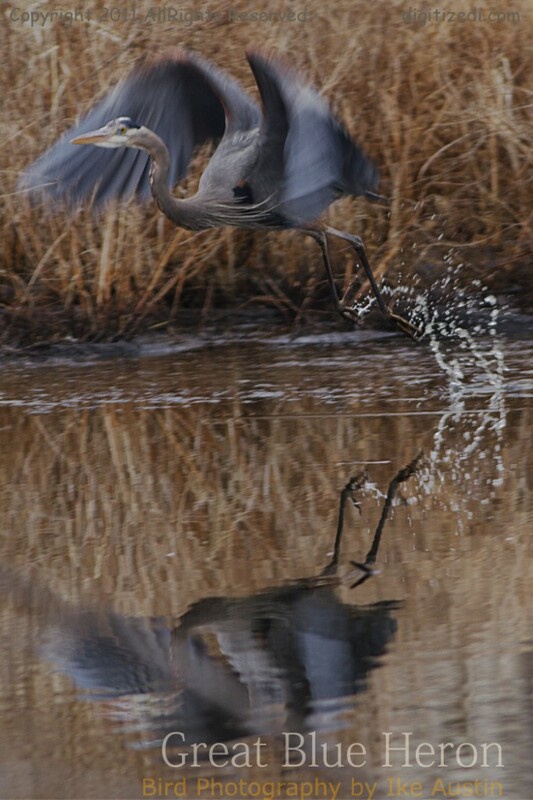 The Blue Heron will glide over the surface of water until it reach a hunting place. 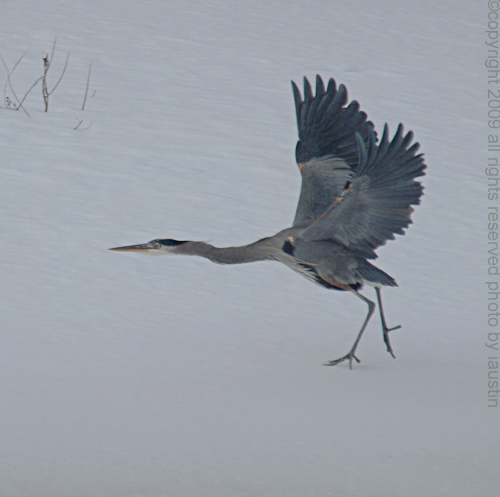 Habitat: The Michigan Blue Heron prefers open grasslands, lakes and wetlands. 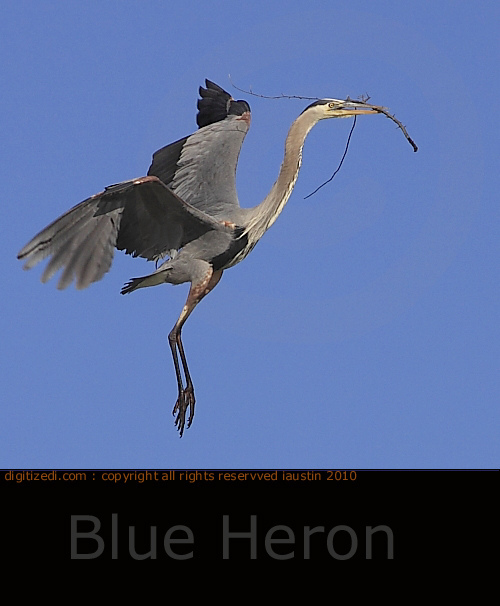 Nesting: Blue Herons will construct a rather large mounded nests made of branches and twigs of various sizes. They can be spotted high in the tops of trees, in parks in what can be best described as amazing tree top condominiums technically called a rookery. There might be 30 or more pairs and families of blue herons cackling and making all sorts of noises as each brings new branches to expand their own individual nests. Incubates 4-7 pale blue eggs for appx 28 days. Younglings go in flight in about 60 days from day of birth. 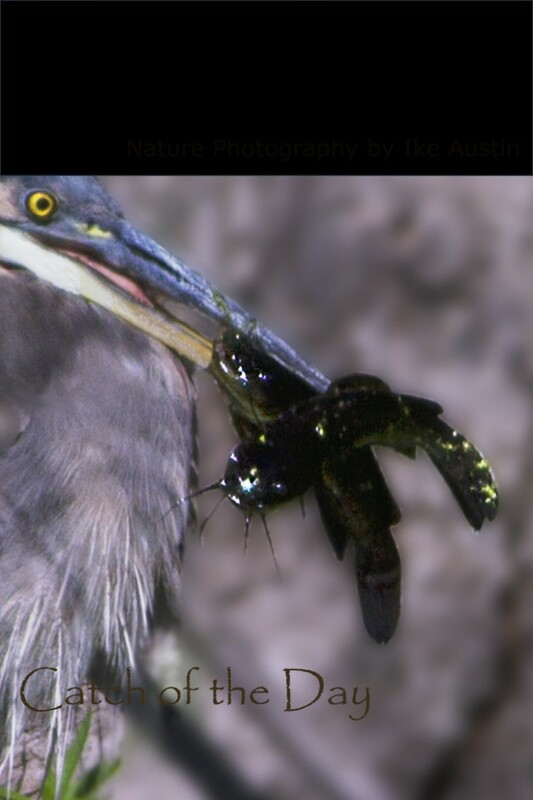 Mating Habits: The Michigan Blue Herons mate for one year and find a new mate for next season. Off Spring: (Juvenile) as with most larger birds. Feeding: Fish, frogs(amphibians), small chipmunks etc. Call: Series of low-deep croaking noises. As a kid, I spent an enormous amount of time down by the river. I was drawn like a magnet to the many sounds of nature that filled the air-the tides rumbling ashore, the faint call of seagulls echoing in the distant background. I would remain there all day under the pretense that I was fishing. I would walk the shores for miles, moving from one spot to the next. I later discovered that the sky above this river was alive.